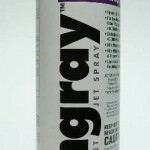 PRODUCT DESCRIPTION: An aerosol which dispenses chemical quickly and at a high rate. It "freezes" wasps and bees on contact. TARGET PESTS: Wasps and bees. WHERE TO USE IT: Outside only. RATE OF APPLICATION: One can runs for only a minute or two. You can easily waste this material so make sure you know where the nest is before you start spraying. Keep it on hand when doing nest scraping.